4POS SC is aimed at the outlet that needs a multi terminal point of sale solution. Just input your stock and use it to process sales, track inventory, print receipts, invoices and barcodes. It has been specifically designed for ease of use. It is straightforward for your staff and you have a business overview at a glance. The software may be used as a stand alone point of sale solution alternatively up to five client programs can be used with it in the same workgroup as a multi lane solution. 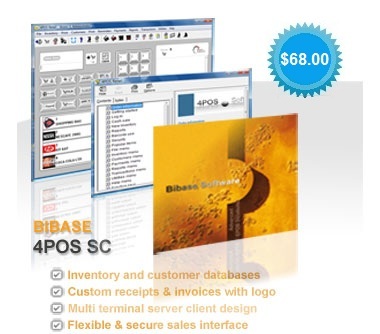 4POS SC requires Windows XP Pro or later. The client, Windows XP or later. Holds databases of inventory, customers and suppliers. Unique sales interface that staff will be able to use in minutes. Track any item with the unique transaction reference with secure staff log on. Inventory and sales software with intuitive interface for sales staff. $68.00 Inclusive of CD, manual and free worldwide shipping. It may be coupled with a bar code scanner and is designed to allow the main operations to be used from a touch screen (not required). The price includes a single server license and five client licenses. The server contains the database management system with no inventory information held on the clients. The server client design is an advance on the standard file sharing methods and requires far less data be transferred over the network. The client setup simply involves the name of the computer with the server application. The client program is essentially a dumb terminal that can be added or removed from computers as required. The product is designed for use on a LAN and uses the robust Microsoft RPC technology. Please note that network hosting the server over a WAN is not a supported topology. The client program offers the common point of sale functions and as no local database is maintained requires minimal maintenance. It takes all but a few local settings (printer, till) from the server. The 4POS SC file structure is identical to that of our standard 4POS Retail permitting a straightforward upgrade path. The server and client may be run on the same computer for evaluation purposes. The product requires a Microsoft 'Workgroup' network. The shareware versions may be used to check connectivity. Note that Windows XP service pack 2 was known to affect remote procedure calls (Service pack 3 corrected it). The Windows firewall being disabled may also simplify any connectivity issues. Please also see these RPC troubleshooting notes.